You know how some sci-fi, fantasy manga always had incredible size machines like aircraft. Well, the Stratolaunch aircraft you see here is not straight out of any manga, though. 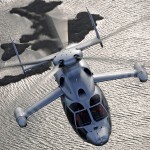 It could very be because, it is undoubtedly a mind-boggling aircraft of gigantic proportion. In fact, it is the world’s largest plane and the biggest aircraft mankind has ever put into the sky, ever. The size is not nothing frivolous, btw. 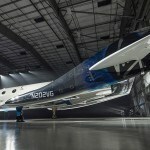 It is required for what it is designed to do and that is to fly up to near the edge of stratosphere to launch a small rocket destined for orbit – the same method Virgin Galactic is using to launch the VSS Unity. 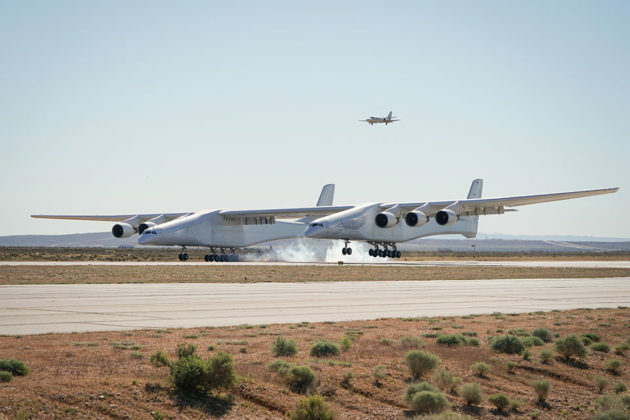 In many ways, Stratolaunch is the bigger sibling to the launch craft of Virgin Galactic, the White Knight Two. 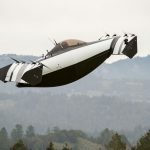 It shouldn’t come as a surprise cos’, both twin fuselage aircraft are built by Scaled Composites. But just how big is this bird? It has a wing span that stretches 385 feet (117 meters) across. To put things in perspective, a standard football field is 120 yards or about 109 meters in length and FIFA standard soccer field is anywhere between 110-120 which is about 100-110 meters. So, yeah, it is literally longer than both a standard football and a soccer field, and not surprisingly, it is rather hefty weighing over half million pounds. Despite the almost incomprehensible size and weight, it still flies. 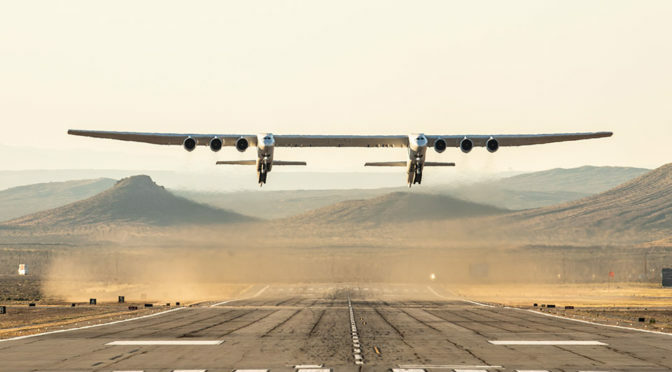 Speaking of flying, the enormous dual-fuselage aircraft made its first flight last Saturday, taking off from a desert runway in Mojave, California, U.S.A. 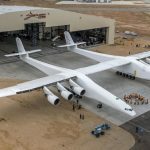 The historic flight saw Stratolaunch flew for 2.5 hours over the Mojave, attaining a top speed of 189 miles an hour (or 304 km/h or 164 knots). 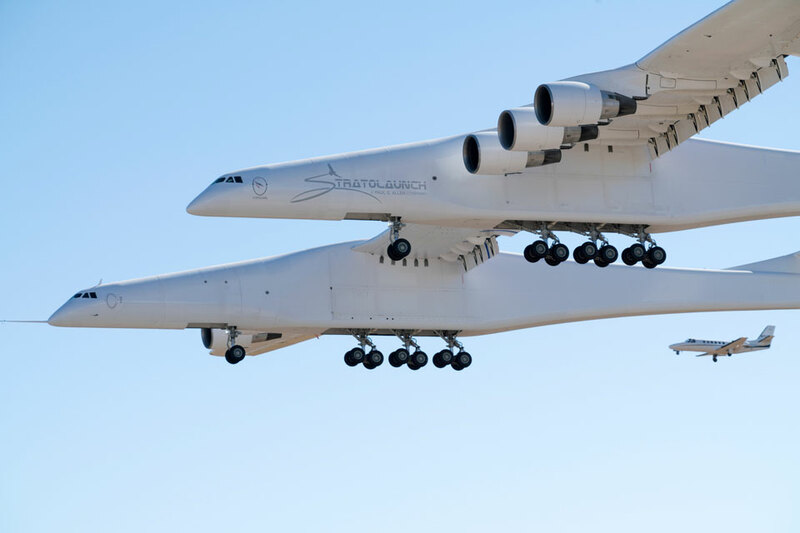 Powered by six Pratt & Whitney PW4056 engines (the same engines used on the Boeing 747s), Stratolaunch is able to support vehicles weighing over half a million pounds (226,769 kilograms). Apart from the engines, the avionics, landing gear and even flight controls are also adapted from the 747. Previous PostThis Is The First 3D Heart Printed Using Patient’s Biological MaterialsNext PostWacky Waving Inflatable Tube Guy Because, You Know You Want It!